Sapodilla juice / milkshake is a very smooth, value for money juice recipe ever. This fruit has different names like sapote, noseberry, sapodilla plum, chico sapote, chikkoo and so. 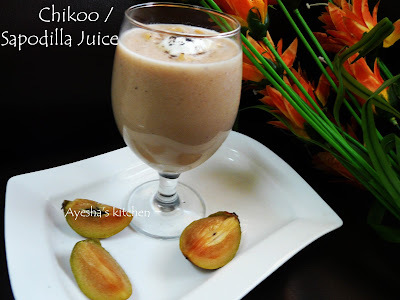 So today lets learn to make this simple quick easy sapote juice or milkshake recipe. Remove the skin of chikoo properly and cut the fruit in quarters. Remove the seeds. Blend it with 1 cup of milk, sugar and a scoop of ice cream until smooth. Then add the crushed ice and pulse for few seconds and pour it into glasses. Top it with a scoop of ice cream and sapote chunks.